At a public meeting in Truro on Saturday, the Communist Party launched the first Cornish translation of the Communist Manifesto, the 1848 work by Karl Marx and Frederick Engels which has been described as the most influential political pamphlet ever. It was recently completed by Heather Penruth who worked on the text for three years. The meeting congratulated Heather for her vision and commitment in tackling this enormous task. 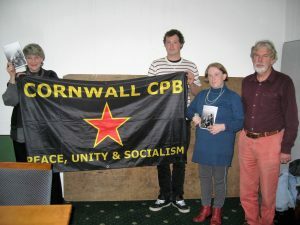 The National Chair of the Communist Party, who addressed the meeting, said that this would be a great addition to the body of literature in Cornish and was symbolic of the struggle of the people of Cornwall over centuries for their rights and culture and against capitalist exploitation. The Communist Party is to donate a copy of Deryvadow Party an Gemynwer to every public library in Cornwall, as well as to Cornwall College and the University of Falmouth. At the launch event Heather Penruth thanked Ray Chubb, secretary of Agan Tavas (the Campaign for the Cornish Language) for his assistance with checking and proofing the translation. After a discussion on the key issues facing the people of Cornwall, chaired by Owain Holland (general secretary of the Young Communist League), Mr Chubb read a section from the Manifesto in Cornish. 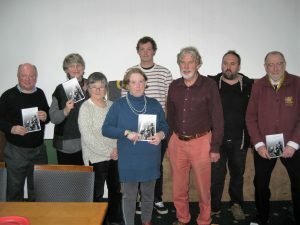 Be the first to comment on "Cornish translation of the Communist Manifesto launched in Truro"